The second day of WEST ESSEX MODELRAIL 2012. The first day of WEST ESSEX MODELRAIL 2012. 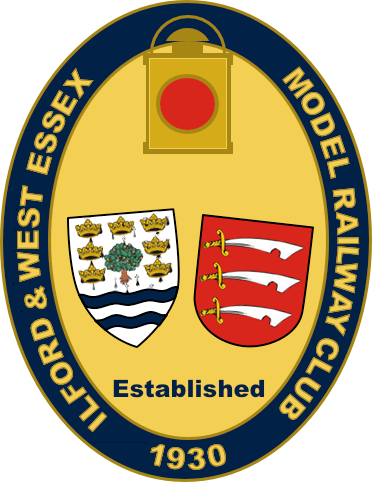 Regretfully we have had to take the decision to also cancel our July, August and September 2012 Steam/Open Days at the club, due to the improvement works at Chadwell Heath Station. Some of our site is still inaccessible and/or unsafe, and it will take us some time to restore the site to a safe and satisfactory condition where we can reopen to the public. We apologise for any disappointments this may cause, and hope to have things back to normal by April 2013! Appointment of Alan Waredraper as Honorary President, with thanks to Peter Pulham for his 5 years in the job, who now becomes Honorary Vice President. Appointment of Steve Wraight as Honorary Chairman, thanks to outgoing Chairman Frank Roberts for his 3 years; Frank now takes on the role of Club Site & Amenities Officer. This year's deserving winner of the Hugh Gwyther Trophy is Charlie Nelson for his unstinting efforts in looking after the club site, not just during the recent Chadwell Heath Station works, but for as long as any one can remember! Former club member Derek Lawrence and some of his colleagues from the Jersey Model Railway Club - on a weekend trip to London for the Alexandra Palace exbhibition - dropped in to play trains with us on the evening of Friday 23 March. Unfortunately, due the ongoing alterations at Chadwell Heath Station, we are unable to open our club site to the public, partly due to safaty concerns, and partly because much of the miniature railway is currently inaccessible. The project is currently expected to last until at least July 2012, and we have therefore had to cancel our planned Steam Days for April, May and June. 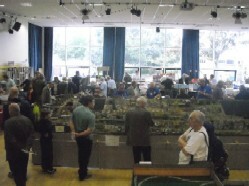 The club's North American Section took Whistling Woods to the Erith MRS Dartford Exhibition 2012.